To ensure the safety of all citizens of the City of Philadelphia, the Department of Licenses and Inspections has performed proactive inspections of multiple private construction and demolition sites in response to the June 5, 2013 building collapse at 2136-38 Market Street. “The Department of Licenses and Inspections is committed to building and construction safety and to the safety of all citizens in the City of Philadelphia,” said Licenses and Inspections Commissioner Carlton Williams. 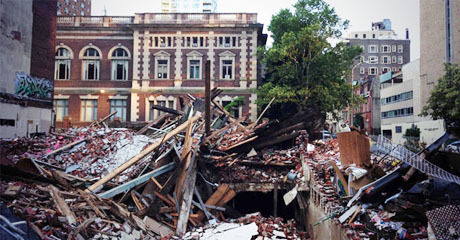 The Department inspected on June 5, 2013 all four construction and demolition sites connected to Griffin Campbell Construction, the demolition contractor at the 2136-38 Market Street site. These inspections uncovered building construction violations at two sites, at 1300 Walnut Street and 320 Butler Street. The violations at 1300 Walnut related to electrical and plumbing work being performed without proper permits and work not being the same as the work detailed on the building permit. The violations at 320 Butler related to work exceeding the scope of the interior demolition permit. The Department issued Stop Work Orders and suspended work at both sites. Inspections at two other sites at which Griffin Campbell Construction has obtained a permit did not uncover any violations. Citizens living or working near all of these properties can be assured that the Department is closely monitoring these sites. “The Department will continue to be proactive in ensuring the safety of all private construction and demolition sites throughout the City,” Williams said. The Department is also undertaking proactive inspections of all active private demolition sites throughout the City. There are approximately 300 open demolition permits issued by the Department since 2009, approximately 100 of which were issued in 2013. As of June 6, 2013, the Department has inspected approximately 10 percent of these sites. These inspections are expected to be completed by next week. Citizens living or working near active private demolition sites should be assured that the Department will be conducting thorough investigations and speaking with all contractors to ensure that there are no violations at the sites. Inspector Ronald Wagenhoffer "Did Nothing Wrong"